In recent years cloud computing has made an entrance into our lives. Naturally, this begs the question how cloud computing can be used in robotics applications. With Rapyuta, the RoboEarth Cloud Engine, an open source software package is released that tries to answer this question. Rapyuta provides an easy solution specifically tailored to robotics applications. Generally, a robotics application interacts with its environment using sensors and actuators. This implies that the data produced by the sensors has to be processed and is normally used as feedback to determine the next action. For actions without hard real-time requirements, processing can be moved to the cloud. This reduces the necessary computing power on the robot, which can improve operation duration for mobile systems and may decrease costs. 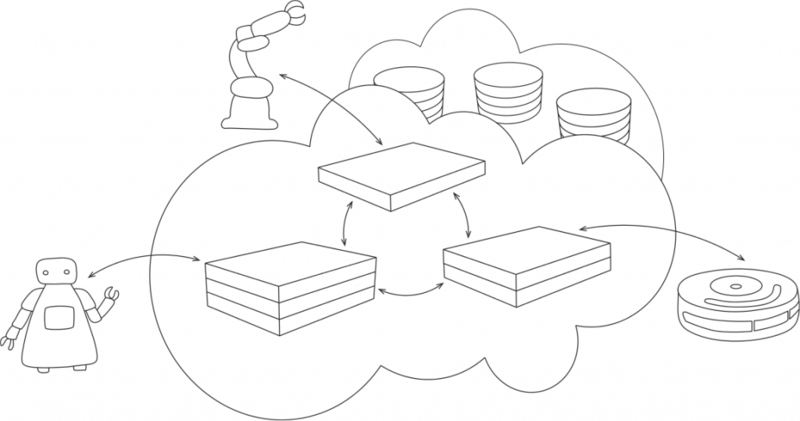 Simplified cloud model: Each robot is connected to its own clone in the cloud (rectangular boxes), which are tightly interconnected with each other and with the databases (circular disks). Many common high-level robotics tasks, such as planning or mapping, don’t require hard real-time. Mapping, for example, involves storing a reusable description of the environment to allow the robot to localize a landmark or itself. Additionally, maps can be used on a large scale to plan trajectories for moving to a landmark or on a small scale to grasp an object, which in turn might include querying an object database for grasp points to get the best position to grab the object. Because planning can be done ahead of time (i.e. act instead of react), it has no hard real-time constraints. The advantages of offloading computation to the cloud can be even more pronounced when considering collaborative robot scenarios. For example, sharing data when creating a common map, or negotiating a cooperative plan when performing a common task can be more easily achieved with a centralized architecture with powerful computational capabilities. RoboEarth allows robots to share knowledge in a centralized knowledge base. This centralized approach has the advantage of avoiding duplicate information and the necessity to constantly exchange newly generated knowledge to avoid duplicate learning. However, to benefit from the full potential of this approach not only requires a centralized storage of knowledge, but also centralized reasoning, i.e. a framework for cloud computation for robots. Until now, RoboEarth only provided data storage for robots. With the introduction of Rapyuta, the RoboEarth Cloud Engine, the missing piece in the cloud infrastructure for robots is added. Rapyuta provides a platform where robots can create computing environments to offload there heavy computation into the cloud. These computing environments can either function as a personal cloud for individual robots or be shared by multiple robots. Additionally, computing environments have high-bandwidth connections to the RoboEarth database, allowing their processes to quickly access knowledge. Simplified overview of Rapyuta: The robots are connected to Rapyuta’s communications module in the cloud. Similarly, the cloud applications running inside the computing environments (LXC) are also connected to the communications module. The module manages communications from and to all connected elements. To simplify the deployment and interaction of the cloud applications Rapyuta, similar to the Google App Engine, defines a protocol for cloud applications. However, in contrast to Google’s model where only web requests are used to communicate directly with the cloud application, Rapyuta introduces an additional layer. This means, a robot does not communicate directly with a cloud application, but uses Rapyuta as a medium. This model gives more flexibility and control over the system. For example, Rapyuta can be used as a relay to communicate directly between robots without the creation of a computing environment. Furthermore, the additional layer implies that Rapyuta allows to run multiple processes using sockets to communicate with each other. Google’s App Engine, however, prevents this, because web applications have no need for communicating processes to service web requests. On the cloud application side the message system defined by the Robot Operating System (ROS) is used. This allows to deploy and run most of the more than 3’000 existing ROS packages (i.e., ROS applications) with minimal to no changes in the RoboEarth Cloud Engine. To separate the ROS nodes, i.e. the cloud applications, for different users, Rapyuta provides individual computing environments. A robot can have many computing environments and a computing environment can be used by many robots, which allows a variety of deployment models. Linux Containers (LXC) were chosen for the implementation of computing environment to securely control all operational aspects such as communication as well as CPU, RAM, and disk usage. Additionally, Rapyuta allows different computing environments to communicate with each other using the ROS messaging system. Rapyuta is open source. The Rapyuta Alpha release is available on github under the Apache License, Version 2.0. For more information have a look at the Rapyuta documentation.